Late last year I took advantage of Alpacka’s annual holiday sale and bought a Scout. You can read about the initial weigh-in here and my thoughts after a few months of use here. Since that May post I’ve put the Scout to its primary use: longer trips combining lots of tough backpacking with moderate floating in nice weather. My thoughts haven’t changed much, and I’m quite pleased with my purchase. The weight and volume savings with the Scout versus a main line Alpacka are significant. Enough to tip the balance from no-raft to raft in some cases. For a summer hiker on milder rivers in the mountainous lower 48, or more broadly in the southwest, it should be seriously considered. It’s a non-starter in cold weather, except on truly mild water. In middling class II or more, you’re going to get soaked. You can beat on it just like a main-line boat. It’s a hair faster than the main-line boats, and considerably better against a headwind. It absolutely cannot carry a bike. The fore-aft balance is dead on, even with a 30 pound pack in the bow. I can and do lean back aggressively in whitewater with no fear of bandersnatching. My rigging, above, has proven solid. I’d keep the three pack tie-downs the same. I’d move the floor strap plate back 4 inches. The XS Prolite, folded in thirds, is an excellent seat, just as good if not more comfortable than the Alpacka toilet bowl seat. The strap plate on the floor, and particularly the bartacks, are a weakness insofar as they create a minor hang point for abrasion. This is analogous to how abrasion is more severe on the seam joints along the edge of the floor. The arrangement holds the pad in place well with minimal fuss, so I’d probably do that over again. A hand loop of 1/2″ webbing through the rear tie-down is a good idea for those inevitable hasty bails before strainers. 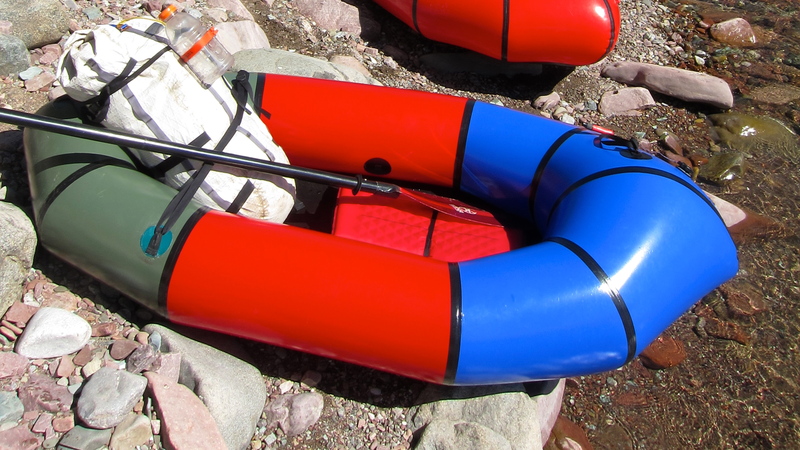 As on any packraft, a keeper loop for the main valve is mandatory. The chief limitation of the Scout could be solved by making it longer, and adding a deck. A backrest is not necessary with the huge stern, and the lack of a dedicated seat is not a detriment for multi-day trips. The small tubes and lack of bow rocker would still plow waves and take on more water, but the lighter weight and smaller wind profile would be worth it in many contexts. Alpacka makes the Curiyak, which is unfortunately a significant step up from the Scout in cost. They also, as of this writing, will not put a deck on it. This is truly unfortunate. Part of me is tempted to sell the Scout and buy a Curiyak. A smaller part of me is tempted to then DIY a deck on it. My only other quarrel is with Alpacka’s quality generally. It is good, but could be better. On both my boats I’ve had to periodically aquaseal places where the seam tape, and on one occasion, tie-down, started delaminating. This is only acceptable on a 500+ dollar piece of gear if you’re the only game in town. Until this summer that was the case. I’ve not heard anything about the Kokopelli Raft Company, but look forward to what some legit competition will bring. I’ve been thinking about getting a Yukon Yak. Is Alpacka’s annual holiday sale in December? Typically it’s mid-November to mid-December. I appreciate the throughness with which you tested the Scout. It was the only other boat I seriously considered, and if I were not planning to go out in cold weather and increase my whitewater skills, I probably would have gotten one. As it is, getting a boat with a deck made more sense. I will be able to use it for a greater variety of things than I would a Scout, plus I got it used so the cost differential was not as bad it would otherwise have been, PLUS I’m short and an older Paca has less of a weight difference than a newer Yak, which is the boat most people use when they compare “an Alpacka” to something else. I enjoyed this review and have a question to ask and hope that is ok! The Alpacka sale is on right now and I’m very interested in either the Scout or the CuriYak as a first time packraft purchase. I’m 6ft about 165lbs and 33-34 inseam. I’m in Europe, Switzerland right now and lack whitewater/rafting experience. I usually hike the mountains and hammock camp but there are plenty of lakes, both at elevation and lower down that I wouldn’t mind being able to explore. If you don’t intend to do much/any whitewater the Curiyak would be a good one boat. If you get sucked into whitewater, even moderate stuff, or spend a lot of time in colder weather you’ll want the warmer drier main line boats with a deck. I’m 182cm, my wife is 173. We can both fit in my Yukon Yak, but it’s tight. Both of us and two overnight packs doesn’t really work. Doing two in one boat river crossings I take the packs across first, then come back and get her. Two in the Scout would barely be possible with room to paddle, and then so low in the water (10″ tubes) and tippy that you’d only want to do the most mellow of crossings. Thank you so much for this review!! Do you think Curiyak can carry a bicycle? I’ve never seen one in person so this is speculative, but I think it would. Likely less well if you’re very tall and/or have a fat bike or 29+, due to both bulk and weight of the bike. Great article. A few points to mention from my experience. I have used both the scout and curiyak extensively for some pretty extreme trips and races. Both are totally amazing and limited only by your ability and willingness to suffer. Many races we have done two people (full adults) in a scout – on moving water up to class II+. Two in a Curriyak in the AK expedition race with lot of glacier gear and glacier fed rivers was not so pleasant, but surviveable. Also have done two night bikepacking trips with a scout too, with points added to the scout for lashing, and taking both wheels off etc….and in this paddled class III. Totally soaked for sure, but not capsizing….so with Alpacka, I really think the imagination is often the defining limit! Good stuff. I still haven’t put a bike on the Scout, with a Yak in the closet it seems needless, but I imagine I’ll go for it this spring.